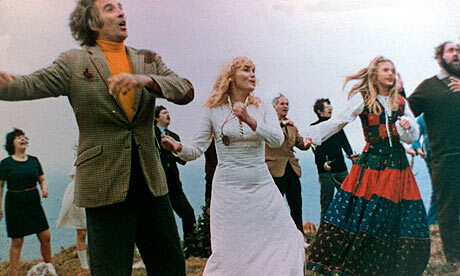 The sub-genre of Folk Horror is possibly the oddest mixture of ideals and ideas ever to join in the world of cinema. Trying to envision a genre taking best aspects from Folk tradition and mix it with the scary and disturbing edges of Horror can be difficult to imagine. However, amongst this small group of films, all of which are brilliant, sits one that transcends the sub-genre and has come to represent the definition of a Cult Classic. Robin Hardy’s The Wicker Man appears to be the director’s only real success in cinema and yet it’s a film that’s left a legacy of paganism, tradition and iconic Horror cinema. Comparing it to the Horrors born of the same era can really help in understanding just how original it really is. With the exception of 1971’s Blood on Satan’s Claw, The Wicker Man is the only horror film to mix its folk ideals with horror and maintain a high quality within both aspects. The story concerns a policeman sent to a remote island to investigate the disappearance of a young girl from a small, pagan community. With the locals becoming ever more evasive and unhelpful in the investigation, Sergeant Howie, played by Edward Woodward, begins to suspect that the girl has been sacrificed for the good of the island’s crops, which failed the year before. The film is famous for its massive twist towards the end where the true plan behind the wicker man itself comes to light. However to spoil it would be as criminal as burning the viewer in an actual wicker man though suffice to say the final ten minutes provoke the sort of gasping reaction associated these days with far more gory and extreme scenarios. Another aspect rarely touched upon in other horror films but constantly engaged in here, is its use of music in a diegetic fashion yet playing it and presenting it as a non-diegetic entity (i.e. the same way a musical present songs). At first this softens the narrative and makes the island and its inhabitants feel rather quaint and charming in their naïve, pagan ways. It’s only with the introduction of Christopher Lee as Lord Summerisle where the songs gradually take on a disturbing edge, turning a fun and obviously silly festival into a tense exercise in suspense. The Optimum release contains only a trailer for its extras but the print is fine. Various special editions are available and contain hours of extras but sadly this reviewer doesn’t have access to them. The Optimum release though is fine addition to any DVD collection and perfect for just seeing the film as opposed to finding out every detail about the production. Very few films can claim to be as original as The Wicker Man. There still hasn’t been a film like it since that truly matches the quality on show in this down to Earth and very local horror. Though there have been some utterly terrible remakes and even a sequel by Hardy himself, nothing will ever outdo the original in macabre joy and an astonishing mixture of themes never really put together successfully in film again. Nice review, although I don’t understand why you mention the twist, then give it away & provide photos!! I was lucky enough to watch The Wicker Man without knowing what the Wicker Man was, and remember how my heart and stomach dropped through my arse when it was finally revealed…don’t spoil it! I’ve only just realised that! Thanks! Taken out the one sentence that spoiled it and also the last picture though quite a few DVD covers actually spoil it now I come to think of it! Would have loved to have seen it in the cinema in 1973. Would have been such a shock! Yes, it’s ridiculous – I remember picking up my VHS copy & the surprise was slapped all over the front cover!